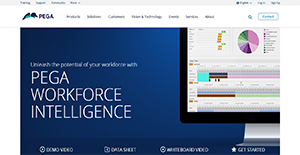 What is Pega Workforce Intelligence? Pega Workforce Intelligence is a best-in-class desktop bot that tells employers about the behaviors of their workforce. The application deploys AI-powered bots to gather information regarding their workers’ activities for the day. This lets them know how working hours are spent: are they performing their tasks or are they spending a lot of time idle? With Pega Workforce Intelligence, managers can gain insights into their team members’ working habits and find solutions to increase productivity in the workplace. Moreover, Pega Workforce Intelligence proves its value by offering actionable data within a month so that task owners can immediately act towards training, automation, and improving various aspects of the workflow. Pega Workforce Intelligence serves as a business’ consultant, albeit a silent and virtual one. The desktop bot runs unobtrusively in the background of company computers, working around the clock gathering data regarding the activities of employees. This way, businesses can leverage the information that already exists within their enterprise. Employees may encounter problems or hindrances in the workplace that distracts them from efficiently finishing their responsibilities. Pega Workforce Intelligence accurately identifies roadblocks to productivity especially during peak hours as well as pinpoint areas form improvement with regard to applications used at work. The latter is especially beneficial to companies since it lets them assess whether their current technologies impede rather than facilitate effective work processes. With Pega Workforce Intelligence, employers can enact plans to improve productivity in the workplace in a matter of weeks rather than months. The program enables this through technology that does not rely heavily on development resources. Instead, it utilizes the existing data from diverse sources to offer intelligence that allows companies to swiftly enhance their employees’ work performances. Pega Workforce Intelligence provides tools that let employers understand the needs of their employees when it comes to training. The application offers information that can be used to tailor feedback and help employees grow accordingly. If you are interested in Pega Workforce Intelligence it might also be a good idea to examine other subcategories of Best Artificial Intelligence Software collected in our base of SaaS software reviews. Each organization has different needs and requires an application that can be personalized for their size, kind of workers and customers, and the specific industry they are in. For these reasons, no platform can proffer perfect features out-of-the-box. When you try to find a software system, first be sure what you need it for. Read some Pega Workforce Intelligence reviews and ask yourself do you desire basic tools or do you need complex functionality? Are there any industry-specific tools that you are searching for? Obtain the answers to these queries to help your search. There are multiple elements that you need to consider and these include your finances, particular business needs, your company size, integration needs etc. Take your time, use a few free trials, and finally choose the system that provides all that you require to improve your firm efficiency and productivity. How Much Does Pega Workforce Intelligence Cost? Pega Workforce Intelligence enterprise pricing plans are available by quote only. The vendor will assist companies in identifying opportunities to further improve their business workflow, starting from their employees. We realize that when you make a decision to buy Artificial Intelligence Software it’s important not only to see how experts evaluate it in their reviews, but also to find out if the real people and companies that buy it are actually satisfied with the product. That’s why we’ve created our behavior-based Customer Satisfaction Algorithm™ that gathers customer reviews, comments and Pega Workforce Intelligence reviews across a wide range of social media sites. The data is then presented in an easy to digest form showing how many people had positive and negative experience with Pega Workforce Intelligence. With that information at hand you should be equipped to make an informed buying decision that you won’t regret. What are Pega Workforce Intelligence pricing details? What integrations are available for Pega Workforce Intelligence? If you need more information about Pega Workforce Intelligence or you simply have a question let us know what you need and we’ll forward your request directly to the vendor.